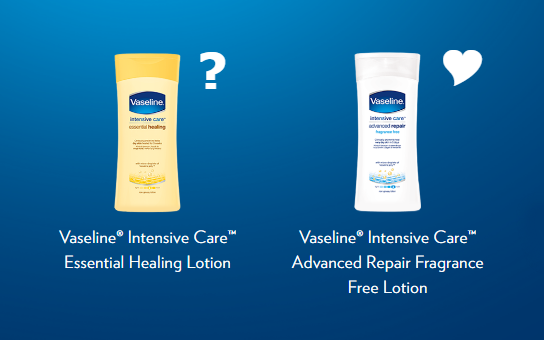 Despite all the creams and lotions that I have tried on my sensitive skin, my overall favourite is the Vaseline intensive care advanced repair lotion – the one in the plain white bottle (used to have a blue top but now it's all white). Vaseline does a quite a range of versions of these lotions from aloe vera to cocoa butter, and supermarkets and Boots often seem to do deals on these – but never the plain version! So when Tesco was offering the 'Essential Healing' version of their lotion at a reduced price I thought I might give it a go. This is the one in the creamy yellow coloured packaging, and owing to its name I thought perhaps it might be a safe bet, though I didn’t really understand what would make it any different to my usual Vaseline lotion. I mean the description on the front says 'proven to keep skin healed for 3 weeks' - amazing, yes please I’ll have some of that! On using the lotion I was immediately struck by one main thing - it is perfumed. Boo! Don’t get me wrong, it smells lovely, sort of like melon, but I do not want perfume in products that are going to be absorbed by my skin. Consistency wise it looked pretty similar to my usual lotion, just plain white, but was a little bit looser, so it went on really easily. Comparing my regular bottle of 'Advanced Repair', to the yellow bottle of 'Essential Healing', my usual one is described as 'clinically proven to heal very dry skin in 5 days' and is rated 4 droplets on the scale of light to rich cream. The Essential Healing bottle says 'clinically proven to keep dry skin healed for up to 3 weeks' and only has a 3 droplet rating, so a lighter lotion. The descriptions are pretty confusing though I have to admit! It makes it sound as if you should start with 'Advanced repair' then move onto 'Essential Healing' for maintenance. Plus I guess it shows that I've been using plain products for so long that I've forgotten that fragrance free is not the default, even on products aimed at dry skin. So how actually was 'Essential Healing' on my skin? Well, as my skin is in a pretty good state right now I could afford to actually give this a try despite the perfume. On my body it’s absolutely fine, no reaction and it feels like it moisturises pretty much as well as the normal one. However on my face, which is always more sensitive than the rest of my skin it left a tight feeling as if it still need moisturising. It hasn’t made me itch or brought me out in dry patches, although my skin has a couple of tiny red patches but smooth not rough. I’m going to get it used up on my legs etc but stop using it on my face, it’s just not worth the risk of my skin getting worse again. For me, even though my skin is effectively 'healed' right my skin just wouldn't be suited to using the 'Essential Healing' on a regular basis. So I’ve learned my lesson now, and at least I know the difference between these Vaseline products!